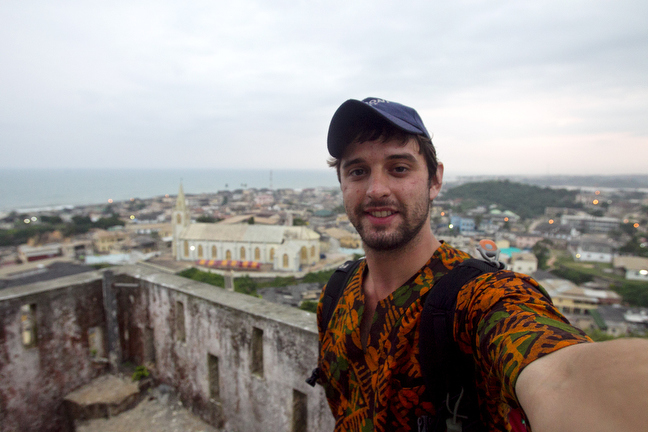 I spent my last few days in Ghana touring some of the beaches and castles along the southern coast of the country. They were all places I had been before during my travels across the country but they felt more special to me knowing that I would be leaving very soon. 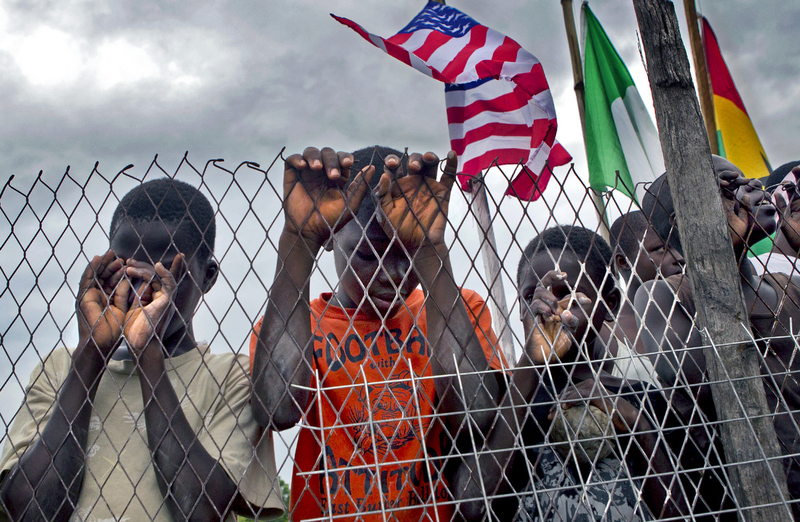 I am very glad to be back in the USA but my time spent in Ghana was very meaningful to me. I learned a very valuable lesson while there; a person doesn’t need much food, money, or possessions to live and be really happy. My last two weeks in the country I left my big suitcase full of clothes in storage at a hotel and packed a small duffel with just a few clothes and items I needed. I realized that even the one bag I had been living out of while in Ghana was way more than I needed. I learned that I don’t need large portions of food to satisfy my hunger, small portions are more than enough. I became aware of how little we as Americans actually interact with each other. 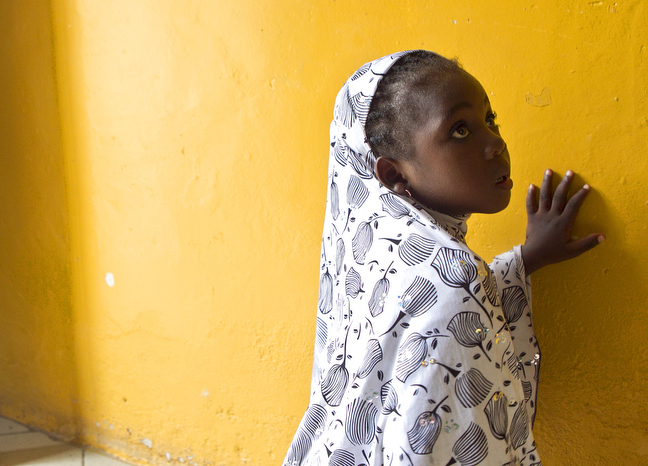 Standing on an elevator or walking on a crowded street without saying hi to a stranger is a common practice here, but it is absolutely unheard of in Ghana, and quite rude. Overall I am glad to be back, but I think a little bit of Ghana will always be with me. 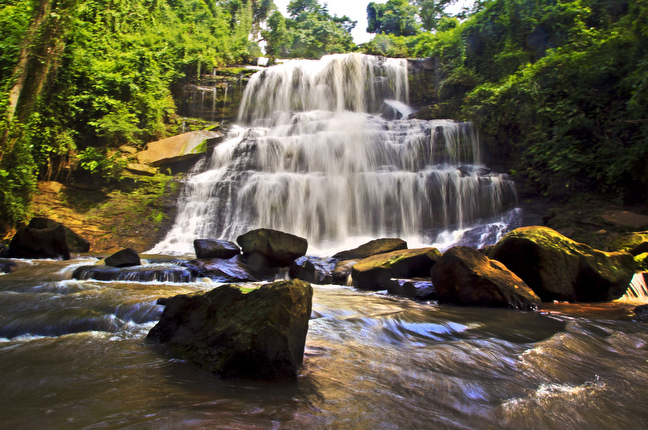 I think I’m a better person and a smarter traveler as a result of my experience there. I would love to keep traveling but I am looking forward to my next adventure; full-time employment. 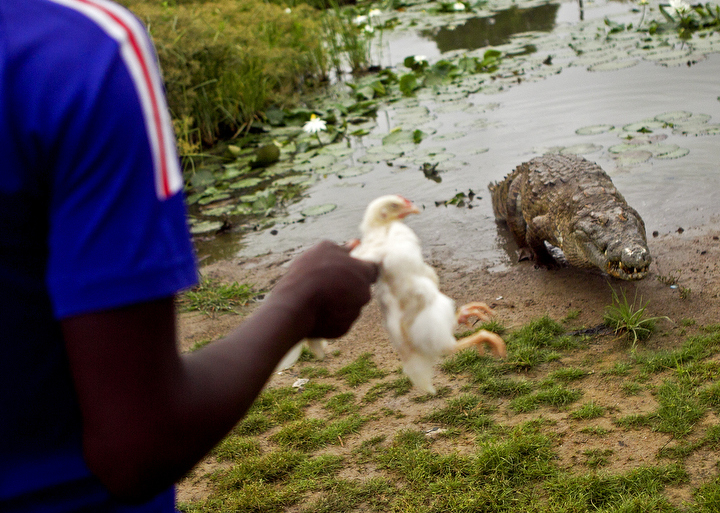 I will post more about that later, but in the meantime, enjoy a picture gallery from my final days in Ghana. I am almost done with my final program of the summer. 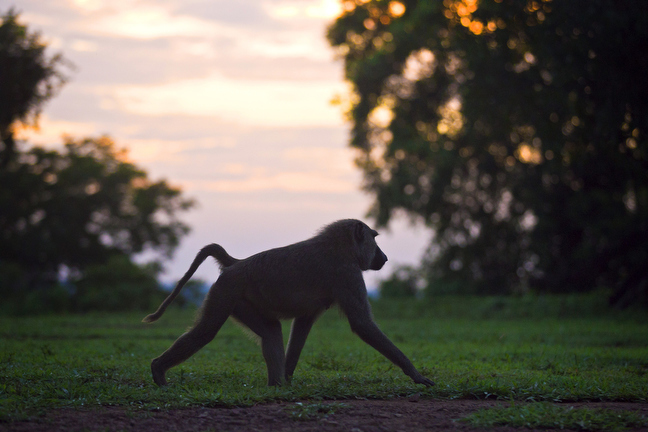 I went on one last safari in Mole National Park and saw some monkeys, elephants and deer. Mole is one of my favorites places I have had the chance to visit and I would love to come back and spend more time there. Leaving Mole, I took the students to Kumasi, the second largest city in Ghana, where we did service work with the Street Children Project once again. 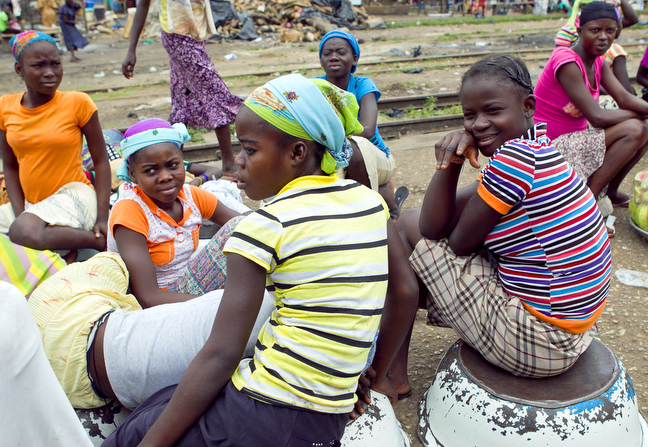 See my August 4 blog post for more information about the Street Children Project. From Kumasi, we traveled back to the coast, where we spent the last few days at a beach paradise resort called the Green Turtle, a place I’d also like to come back and visit. Located far away from any city lights, I was able to get some clear pictures of the stars in the sky. 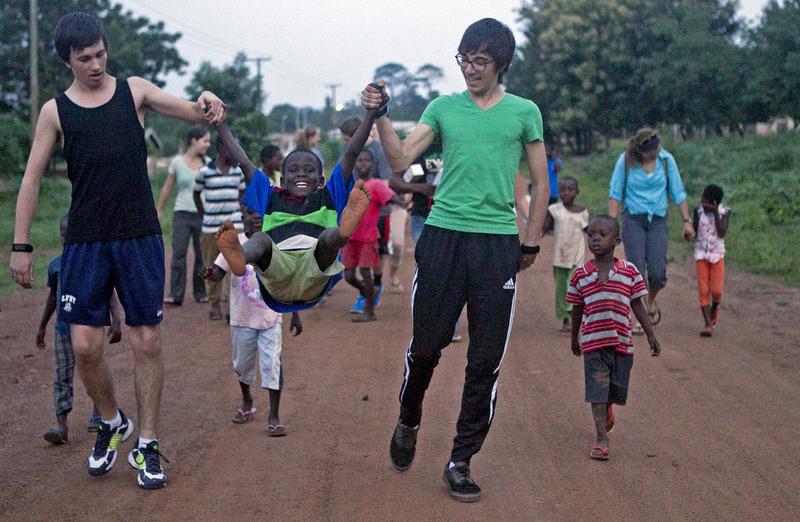 We have been in Bolgatanga for the last three days doing service work and playing with kids. 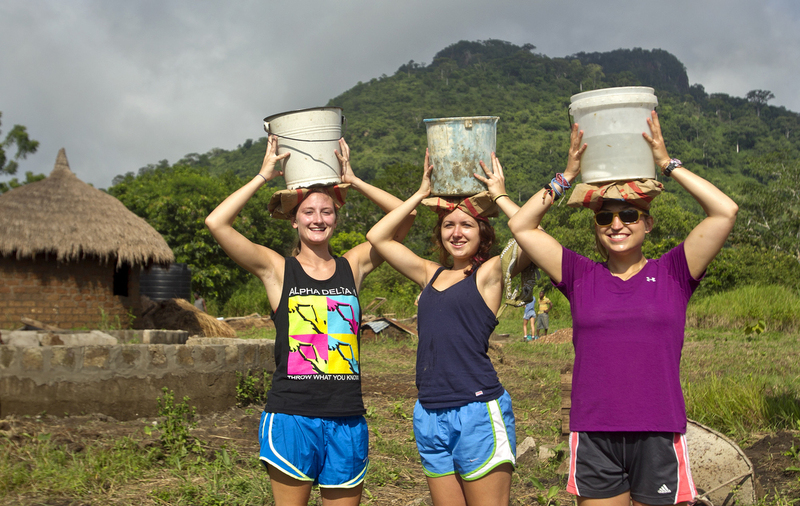 The students have completed their service work here and tomorrow we will head to Mole National Park to hang out with the elephants and baboons. I have really enjoyed my time in the northern regions of Ghana but am looking forward to being in Mole once again with all the wild critters. 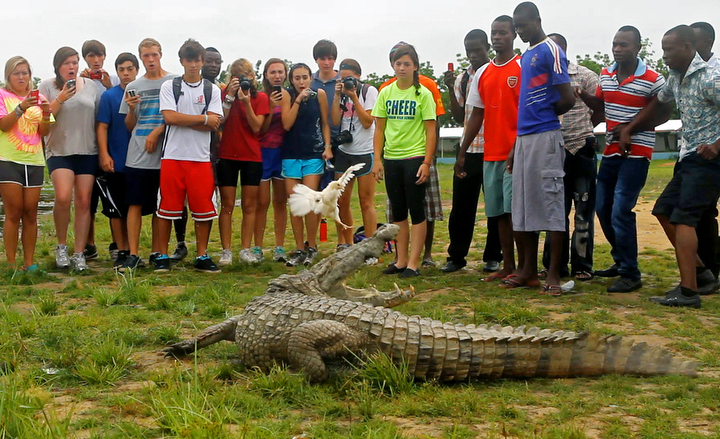 I finished up the Volta Village Life and Service program this past week with trips to Cape Coast and Kumasi. 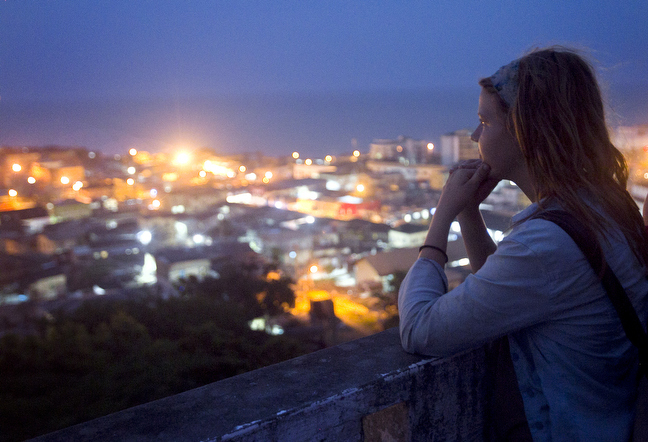 In Cape Coast we climbed an old European lighthouse to get a view of the city at sunset. 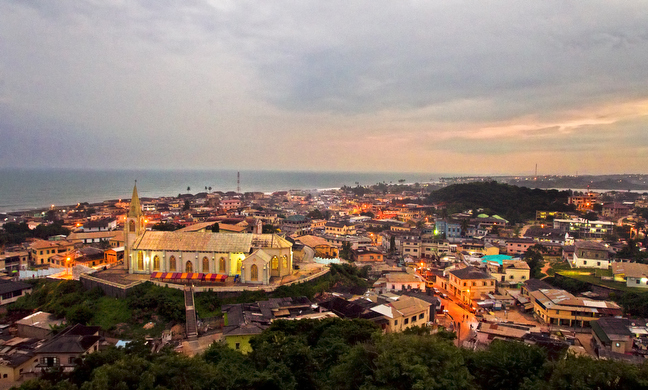 The lighthouse was built not just as a beacon to ships at sea but also as additional defense for the nearby Cape Coast Castle against inland attacks by the powerful Ashanti people. The cannons still remain pointed at the surrounding countryside, now rusty from a couple hundred years of salty sea air. 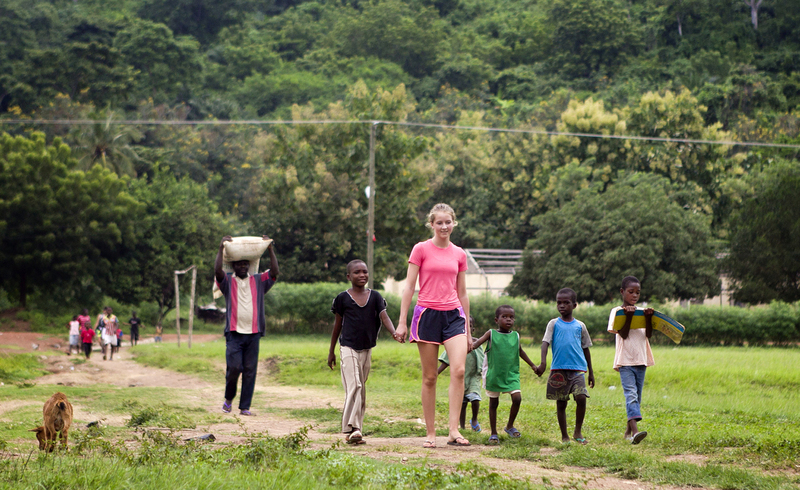 In Kumasi we did some service work with the Street Children Project group. 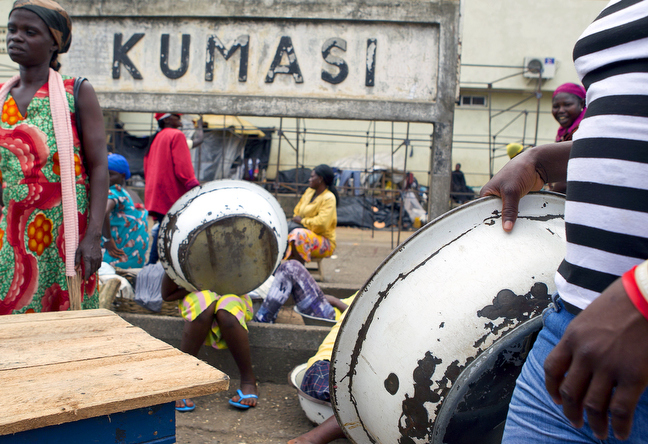 They reach out to kids who have moved to Kumasi from the north to find work on the streets selling various items that they carry around on their heads. 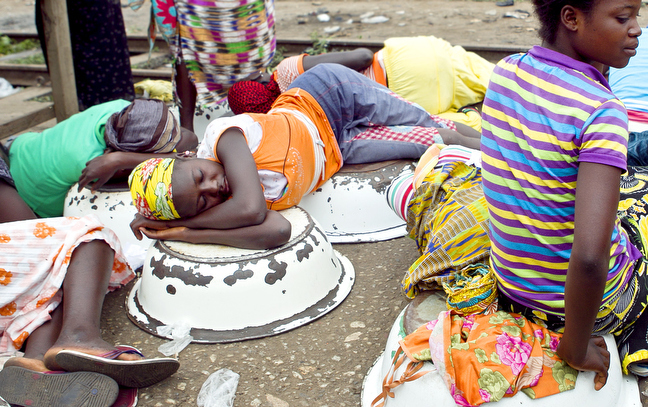 Most are young girls who don’t have a place to sleep besides on the streets and this leaves them especially open to assault. They tend to gather and rest together in large groups for safety, so we found a bunch of them hanging out near an old railway station and invited them to eat lunch with us. The Volta program ended on Wednesday and I am currently with another “Off The Map” group. I’ll do my best to update the blog soon with our happenings. We will be attending a mass celebration for the death of the president at the end of next week that should yield some interesting images. This is my last program in Ghana for the summer, I’ll be returning to the US after this wraps up. I apologize for the delay in updating my blog. 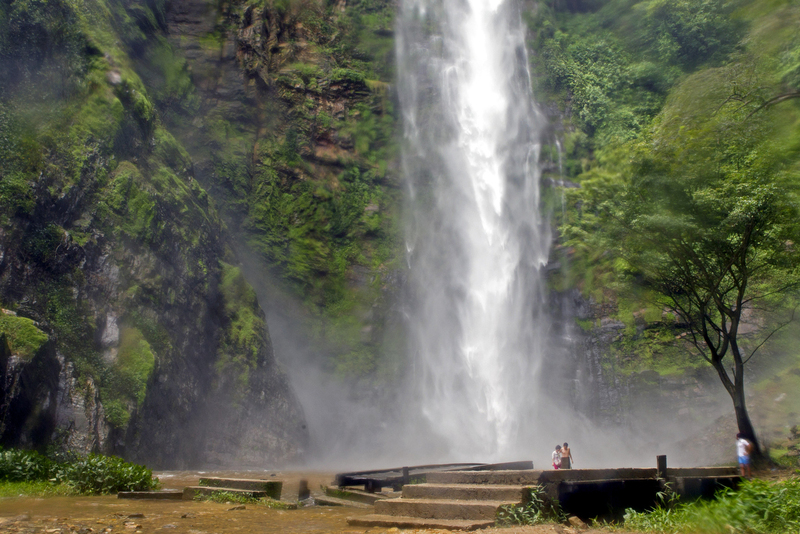 So much has happened since my last post, including the rest of the Off The Map program that I last wrote about, but I don’t have time to post images describing everything and now I have moved on to another program, in the Volta region of Ghana. I had only very slow and sporadic internet signal in the Volta region, which is where I have spent the last week. 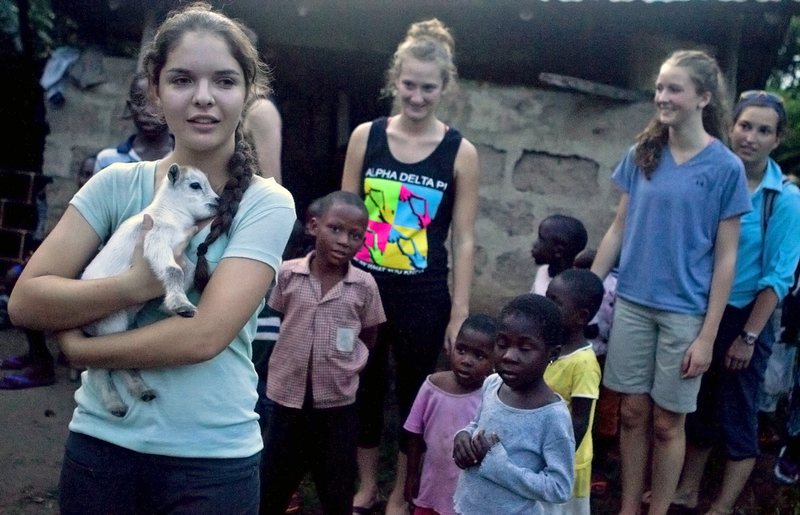 I am currently leading some great students on a program called “Volta Village Life and Service.” It is different from the “Off The Map” programs I led previously because we spend several days in a village staying with families, working with them, and generally seeing how they live. There was a lot of playing with children and pickup soccer matches that took place as well. It has been a very eye-opening experience for us all. We worked to build an eco-lodge guesthouse that will allow visitors to the village to have comfortable lodging and will also serve to bring in some revenue to support the local schools. 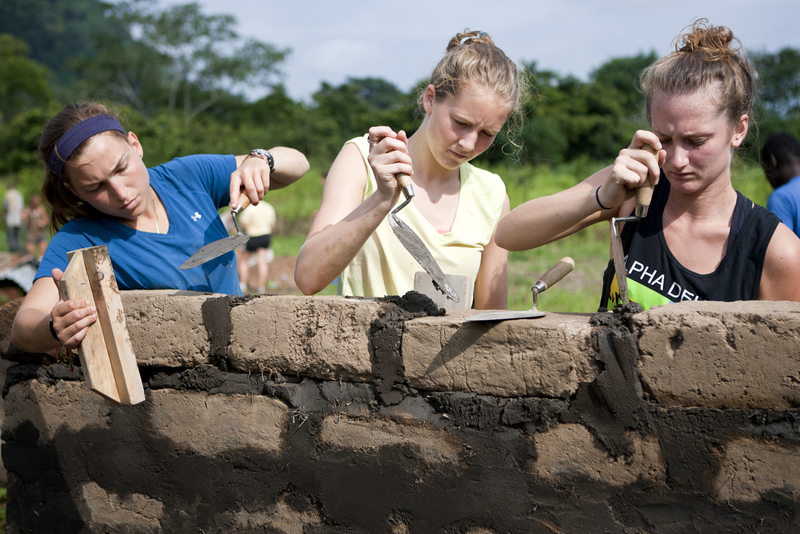 We mixed sand and concrete to make mortar and laid cement bricks to form the walls, stopping every so often to use a bubble level to ensure the walls were straight. The construction methods were very basic but accurate. 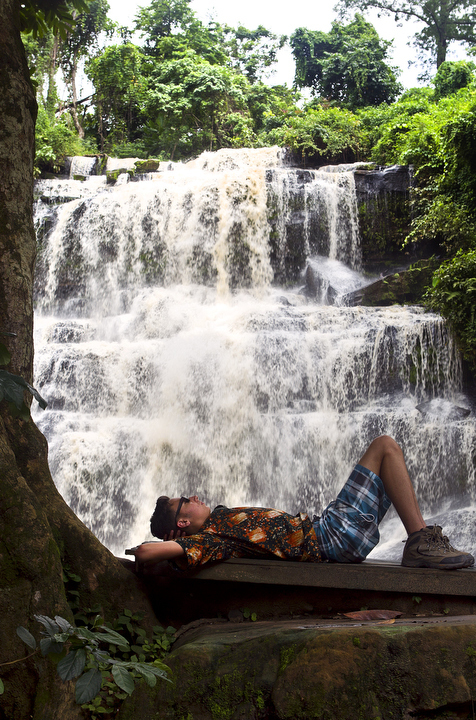 We hiked the highest waterfalls in W. Africa, which turned out to be quite an adventure. We didn’t realize just how demanding the hike was, and we were not warned that the path had been wiped out in some places. My students were adequately prepared for the journey but we did encounter one person at the top who was not and as a result had suffered a harsh fall a few feet onto some rocks. I was able to use my Wilderness First Responder training to help her but it was a tough evacuation process down the mountain and when we finally reached the bottom it began to rain heavily. The woman is doing ok as of the last time I checked in with her. It was a huge relief and confidence booster to have even the limited medical training that I have. 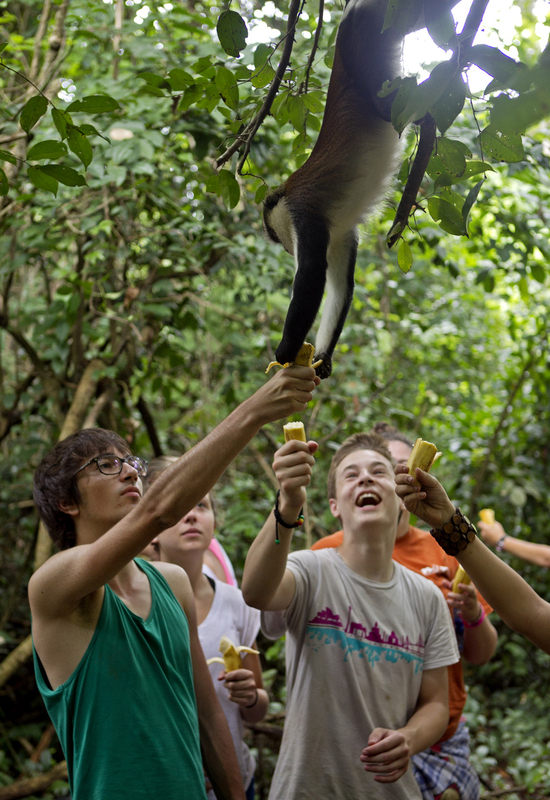 The next day we toured a protected forest, where we fed bananas to monkeys right out of our hands. Tuesday we received word that the president of Ghana had died from unexpected complications due to throat cancer. It is interesting to be here in the midst of these happenings. The flags in the village were flying at half-staff, and I was able to make a picture of some students with the flags during a ceremony to commemorate the opening of a new pre-school building. Rustic Pathways has donated the funds and manpower to run electricity to the school so we were the first people to get to turn on the lights in the building. Later that night, some of the girls made a mud pit and slid around in it. This is the condensed version of what all I have been up to since my last post, I will try to not let as much time go by before updating again. Heading south from Bolgatanga, we stayed in Mole National Park and went on a safari, my second since I have been in the country. 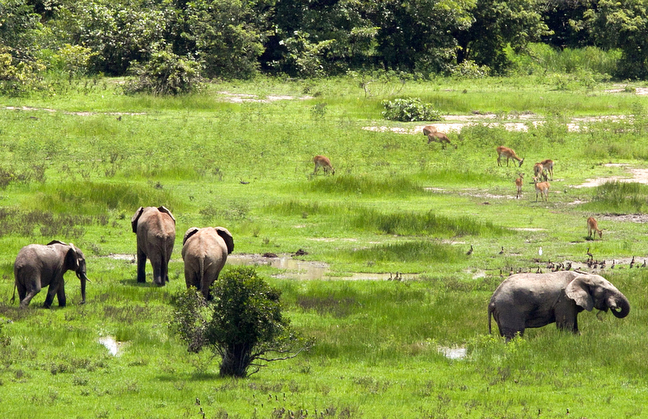 This safari was more successful than the first one I went on two weeks previous, as we managed to spot quite a few animals. 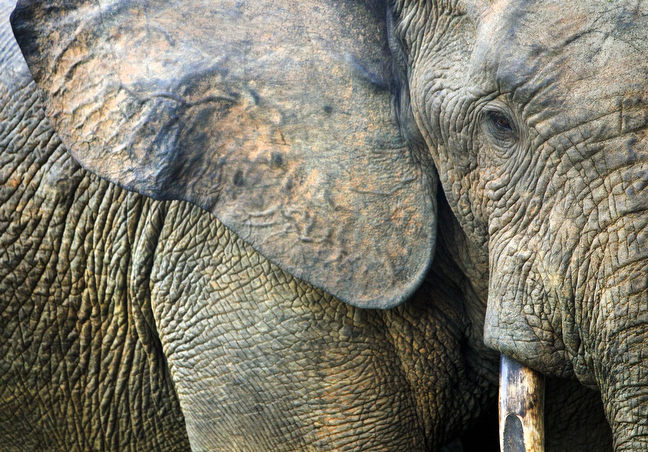 The coolest part about Mole National Park is the fact that as visitors, we are part of the wildlife. 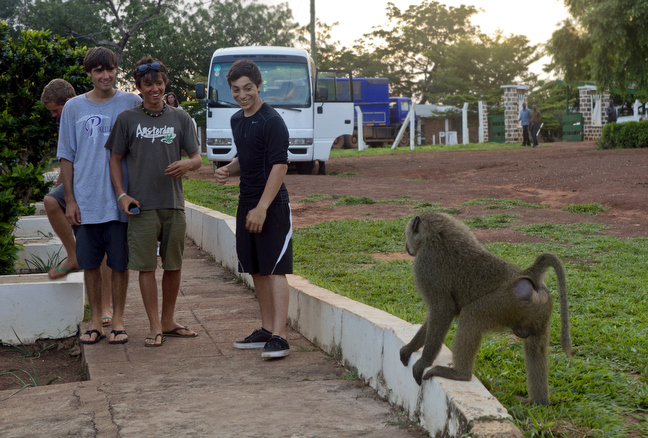 The animals are not separated from the humans and on this trip, we even had some baboons break into our bus and steal some food. As you can see from the pictures, they are not at all afraid of humans. 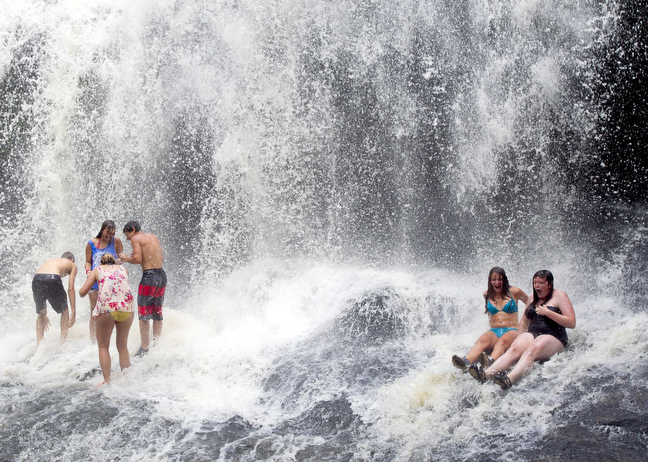 We stopped at the Kintempo Waterfalls, as with the first group of students two weeks prior, taking a dip in the cold stream water. 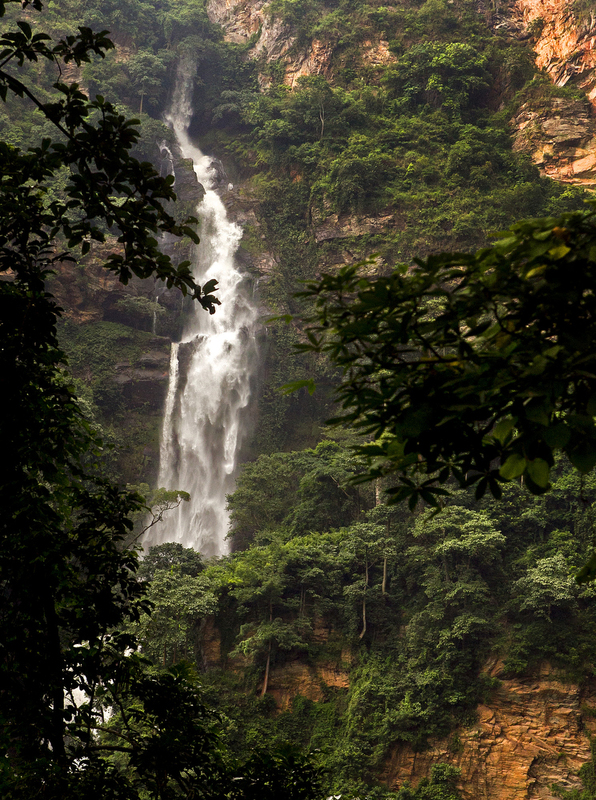 Leaving the waterfalls, we headed south to Kumasi, in the Ashanti Region of Ghana, home of the largest market in West Africa. This time around, due to logistical concerns, I stayed at the hotel, so no pictures of that just yet. 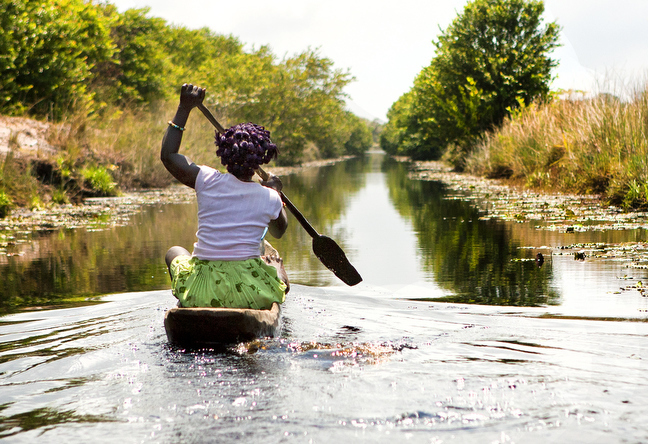 Leaving Kumasi, we headed south to the coast, where we paddled out in handmade canoes to a village built on the water. We then had a relaxing beach day at the Green Turtle, which is my favorite resort location in Ghana. I have promised myself that I will one day come back to Ghana for a vacation and stay at this place. It is a little slice of paradise. We have spent the last two days in Bolgatanga, a town in northern Ghana near the Burkina Faso border. The students complete all of their service work in and around this town. 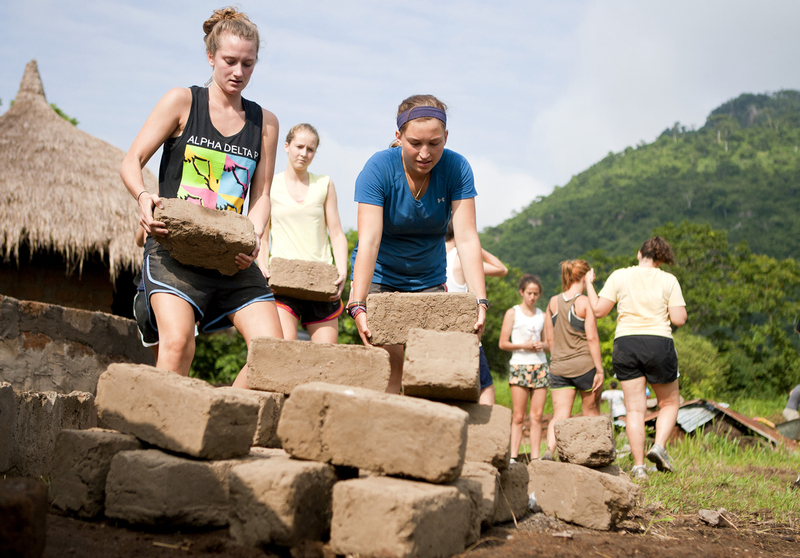 They spent part of one day helping to construct a school in a nearby community. This is the same school project that we worked on with the last Off The Map program, two weeks ago. 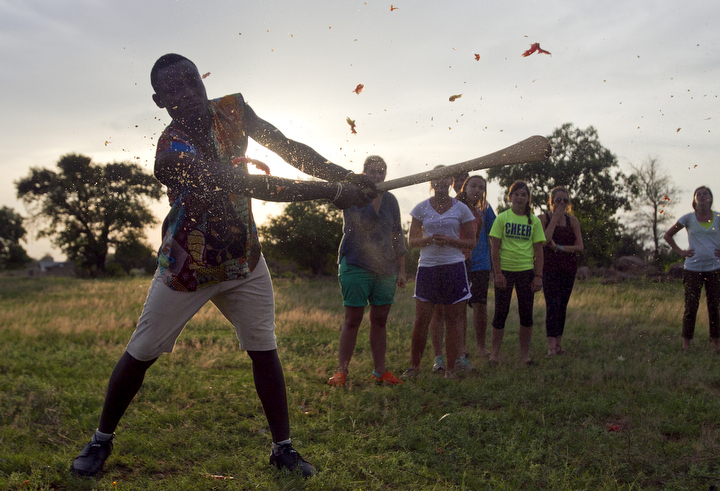 We took some time off from the service work to play a game we made up called “tomato baseball,” which is a combination of baseball and kickball. A tomato is pitched to a batter swinging a large wooden spoon purchased at a nearby market and the batter must explode the tomato, then kick a soccer ball and run around the bases, as per baseball/kickball rules. The game was a lot of fun and made for some great photographs. We also went to the same crocodile pond from my post two weeks ago. I tried to get some different pictures than the last time and I think I succeeded. 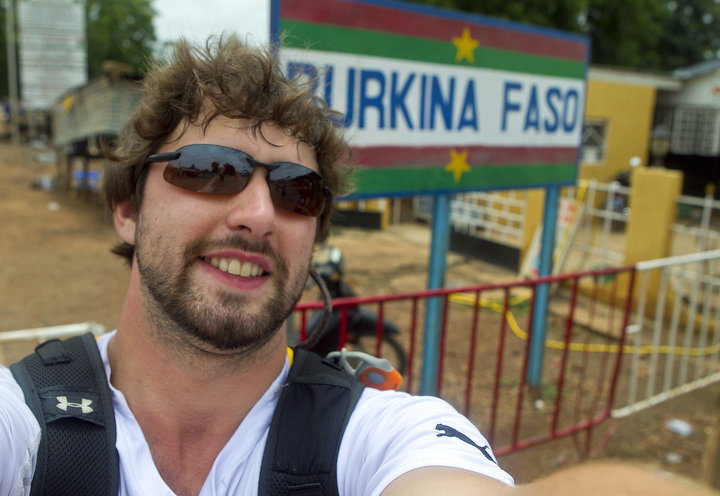 After the croc pond we managed to pay a visit to the Burkina Faso / Ghana border. 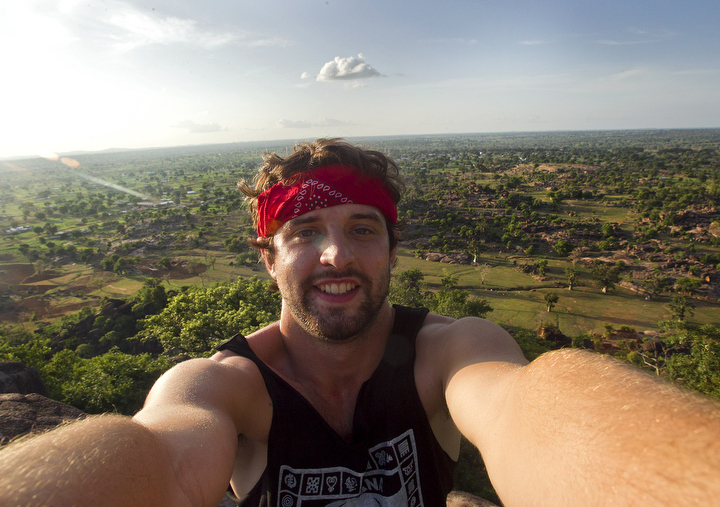 One of the border guards was a nice guy named ‘Free Will’ and he let us pass through to get some photos in the no man’s land between the two countries.Tomorrow we head to Mole National Park, where I hope to get some more pictures of the elephants that roam around the hotel grounds. 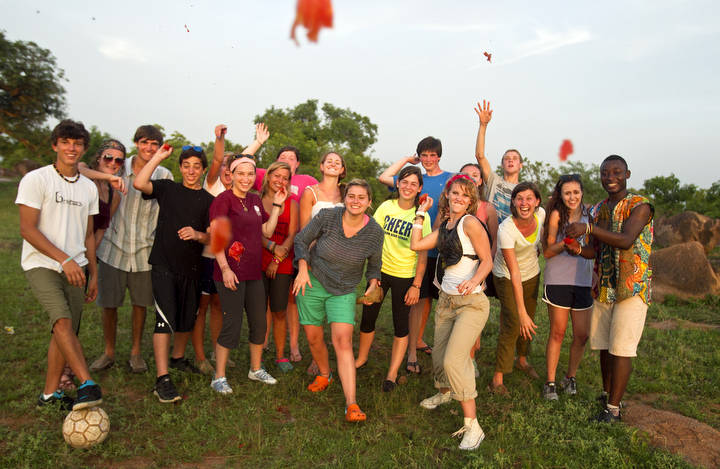 I am back in the northern part of Ghana with my second group of Off The Map students. They arrived in Accra Wednesday afternoon and after taking them for a walk on the beach we gave them a program orientation and let them rest. Yesterday morning (Thursday) we flew to Tamale and then drove to Bolga Tanga which is at the top of the country, near the Burkina Faso border. We took the students to play with some children that evening at a program called “Night Rabbits” which is an evening program designed to teach children who must work during the day rather than attend school how to read. The kids put on a drumming and dancing exhibition for our students. Today (Friday) we have just returned from a sunset climb up the Tongo Hills after spending the day passing out Tom’s shoes to some schoolchildren. Because I have the opportunity to participate in some of the same activities twice working multiple Off The Map programs I decided to photograph this one in a different manner than the last. I’m carrying just one camera with a wide angle lens, forcing myself to get close to people. 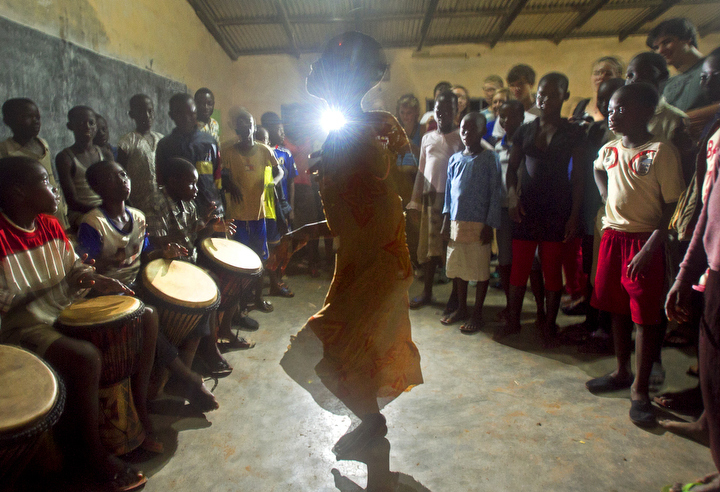 A drumming and dancing exhibition put on by the Night Rabbits students. 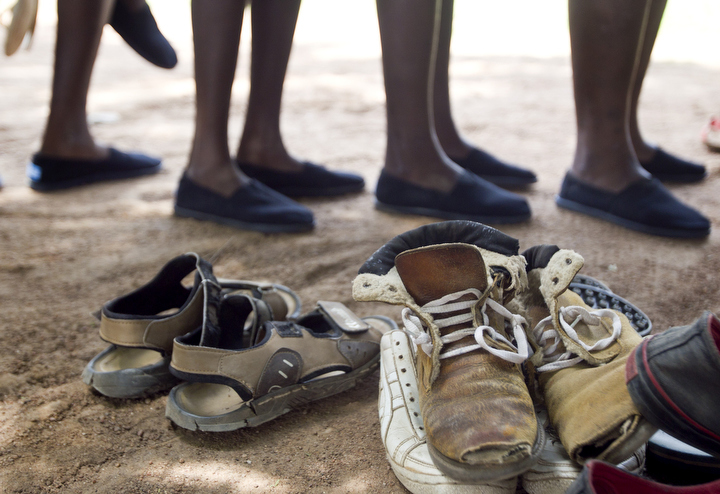 A student tries on a pair of Tom’s shoes during our service project. My students from the first Off The Map program should be back at home in the states by now. I have collected a second group of students in Accra, flown with them to Tamale and am now back up in the north of Ghana repeating the Off The Map program a second time with a new group. 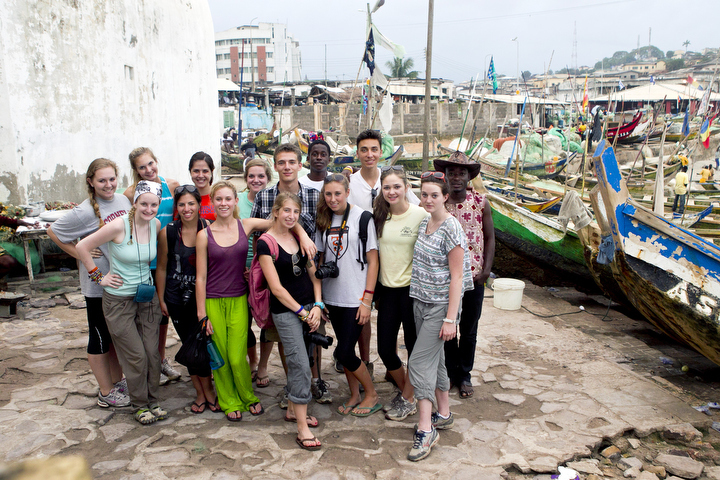 But before I parted ways with my first group in Accra we had a lot of fun in Cape Coast. We toured a slave castle, which was a sobering experience, and we also had the chance to explore the club scene in Cape Coast. I don’t have any pictures from the second activity, however. 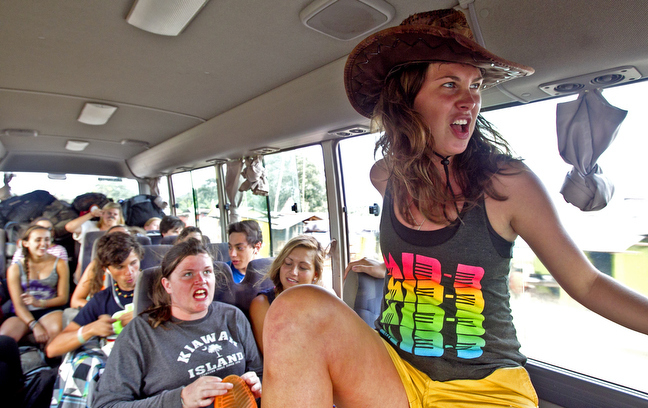 So in honor of my first ever Rustic Pathways student group, here are some pictures from our last days together. I will be posting more images from my new group in some of the same locations as before, but now I have the opportunity to improve on what I have already shot and look for some new angles. 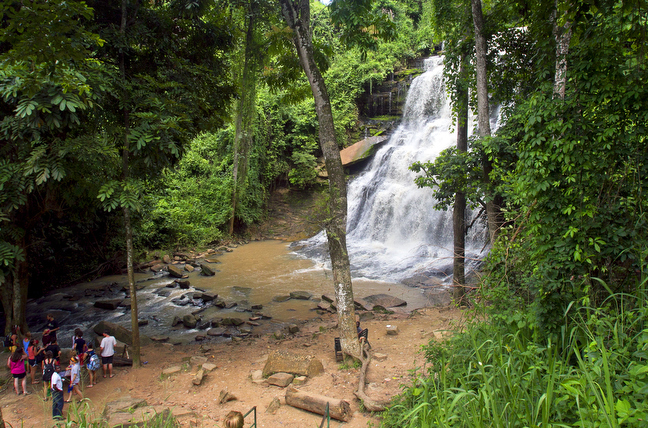 We stopped at the Kintampo Waterfalls for lunch while heading south to the coast from Kumasi, which is in the center of the country. A few of us jumped in and played in the rapids, but the cold temperature of the water kept the majority of the students out. 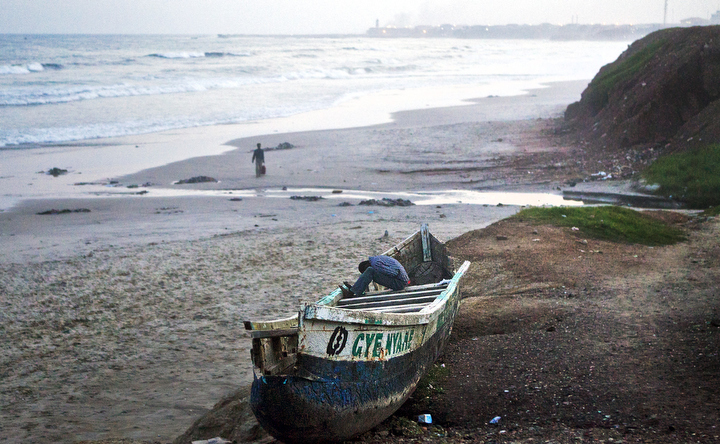 Once we arrived on the coast we stayed at a couple of beach resorts, picking our way back to Accra. The first was the Bayin Beach Resort. 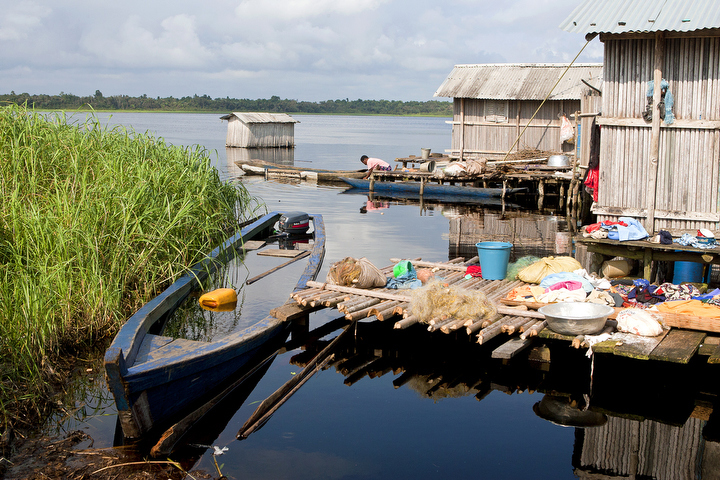 While in Bayin we toured a stilt village that was built out on the water. 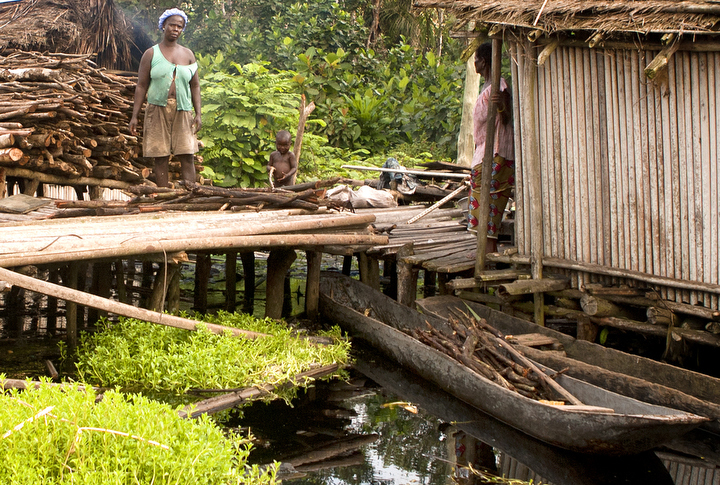 The townspeople conduct their lives above the water of a secluded inland freshwater cove. 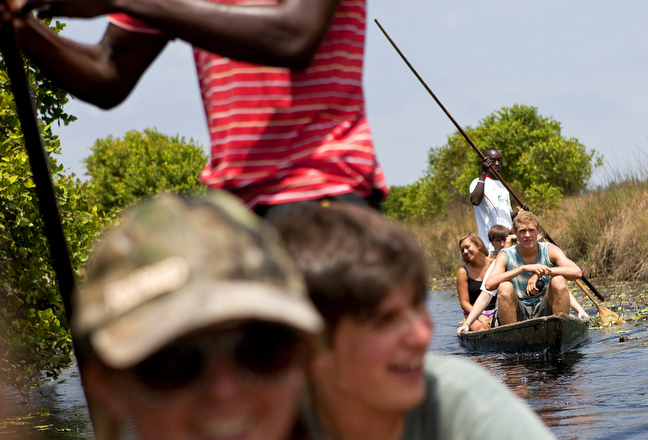 It took us 30 minutes of paddling by canoe to reach the community. We then moved down the coast to the Green Turtle, which is an amazing beach resort paradise. I did not want to leave and am already looking forward to coming back with the next group of students. 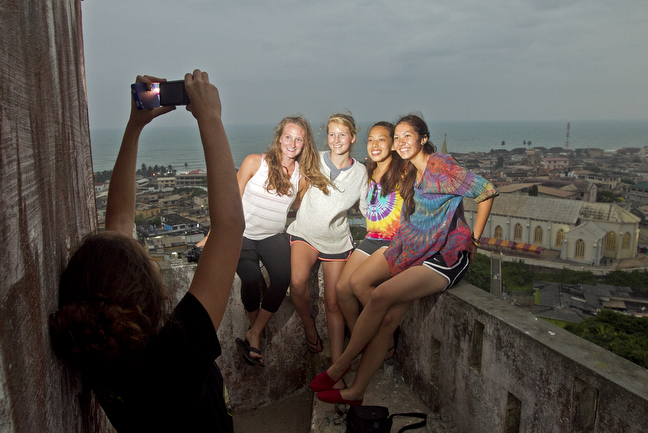 We are currently in Cape Coast, which is our last stop before we return to Accra and pick up a new group of students.